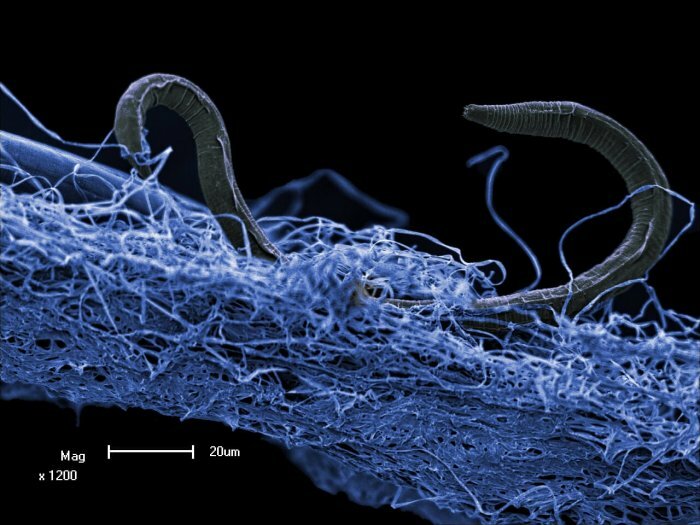 Now a new paper [below] describes not only the discovery of additional deep subsurface life, but also tries to explain how the distant ancestors of the worms and bacteria and algae might have gotten there. “After the discovery of multicellular animals in the deep subsurface up to 3.8 km (2.5 miles) in South Africa everyone was baffled and asked the question how did they get that deep? This question more or less haunted us for more than a decade as we were unable to get our head around it. This makes sense because the deepest soil inhabitants live at about six feet below the surface, said Borgonie, formerly of the University of Ghent in Belgium and now with ELi, a Belgian nonprofit that studies extreme life. So another route to their deep subterranean homes was necessary. Borgonie and his team conducted a variety of tests — seismic, geological, genetic — but one stands out as most conclusive. 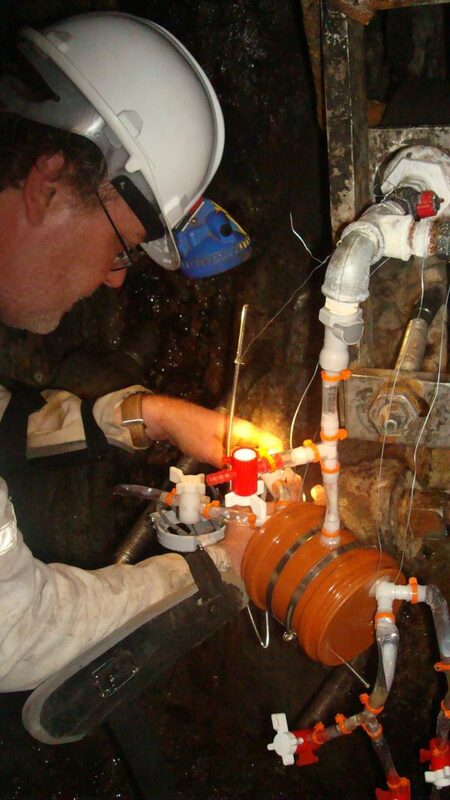 At the Kopanang mine, they had found the roundworm Poikilolaimus oxycercusin in water about a mile underground. What appeared to be the same nematode was also collected from the the Vaal river, a few miles from the mine. The two appeared to be genetically similar, but the best test was to see if they could successfully reproduce. And the answer was that they could. It was a smoking gun, though not necessarily a common one. Nematodes from other surfaces and subsurfaces were placed together and were not able to produce young that survived. As explained in the Scientific Reports paper, this may be a function of the once companionable subsurface nematodes having adapted to their environment in ways that broke their connections with surface nematodes of the same species. While nematodes can hibernate for long periods in what is called their dauer stage, when they wake up they survive for only 20 to 30 days. Their lines, however, can last in the subsurface for those very long periods. The nematodes collected and tested for this most recent article were but a small part of the zoo of creatures that have been collected from deep underground in South Africa’s Witwatersrand Basin. There was also algae, fungi, bacteria, a crustaceans and even a few insects, the paper reports. The bacteria is important for the nematodes in particular because they are a food source. These ecosystems survive in scalding temperatures, in the absence of sunlight, at high pressure and without oxygen. Yet they have been found as far down as almost three miles below the surface, though in far more isolated conditions at that depth. The age of that life is difficult to determine. While methods exist to determine the age of the fracture water, scientists cannot definitively say when the lifeforms arrived. Still, Borgonie reports that the worms found at the Kopanang mine had been present for between 3,000 and 12,000 years, or rather their ancestors had been there. Borgonie and his colleagues had earlier discovered the first multicellular creature at great depth, Halicephalobus mephisto, in mine fracture water .6 to 3 miles down. That discovery, announced in 2011, helped establish that the deep subsurface was more able to support life, even complex life, than expected. Often the creatures were living in biofilms, loose collections of bacteria and other life held together in the water by secretions that encase them. 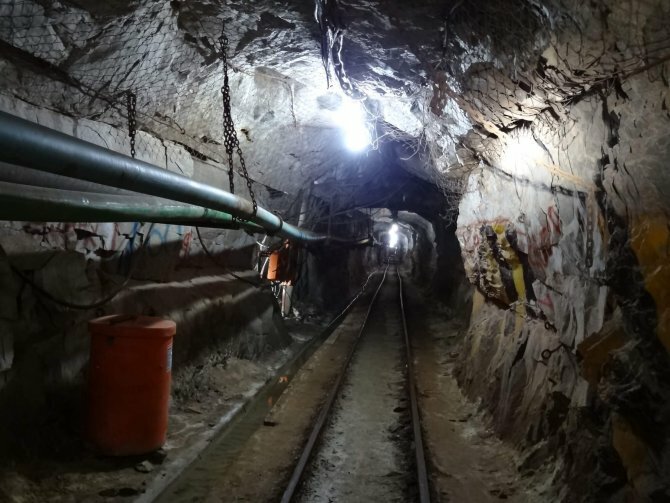 Another aspect of the deep subsurface nematode story involves specimen found in salty stalactites at the Beatrix gold mine. The worms identified, Monhystrella parvella, are associated with salty environments and so the group inferred that the water and creatures may have come from a sea. There were such seas in what is now South Africa, but it was very long ago. “M. parvella does not have a hibernation stage and cannot survive in fresh water, thus it must have been and must be in brackish water all the time,” Borgonie said. “The question is did this happen long ago when that area of South Africa was covered by a sea or did it happen via the salt pans surrounding the Beatrix mine? Recent reports of another nematode species, unaffiliated with South African mines, suggests just how robust and adaptable individuals can be — in this case regarding deep freeze hibernation. 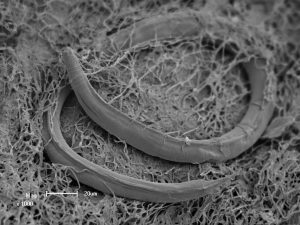 The longest recorded nematode hibernation was 39 years until Russian scientists announced the discovery of frozen nematodes in deep Siberian permafrost. The worms had been asleep for 42,000 and 34,000 years respectively. A Science Alert article raises the possibility of contamination as an issue, but the scientists maintain they took all possible precautions and are convinced the frozen hibernations were as recorded. That the South African deep subsurface life appears now to have come from the surface — via seismic fractures that could bring rushes or trickles of water filled with life many miles down — does have possible implications for Mars. While no signs of early life on Mars have been discovered, research in recent years has proven that the planet once had substantial water and warmer temperatures. In other words, conditions that might be hospitable to life. That theory of a once quite watery Mars was taken a significant step further last week in an article in the Journal of Geophysical Research — Planets , which found evidence of an earlier planet-wide groundwater system. Such a system had been predicted before by models, but now there was significant hard evidence that it had indeed existed. Salese and colleagues explored 24 deep, enclosed craters in the northern hemisphere of Mars, with floors lying roughly 4000 meters (2.5 miles) below Martian ‘sea level’ (a level that, given the planet’s lack of seas, is arbitrarily defined on Mars based on elevation and atmospheric pressure). The scientists found features on the floors of these craters that could only have formed in the presence of water. 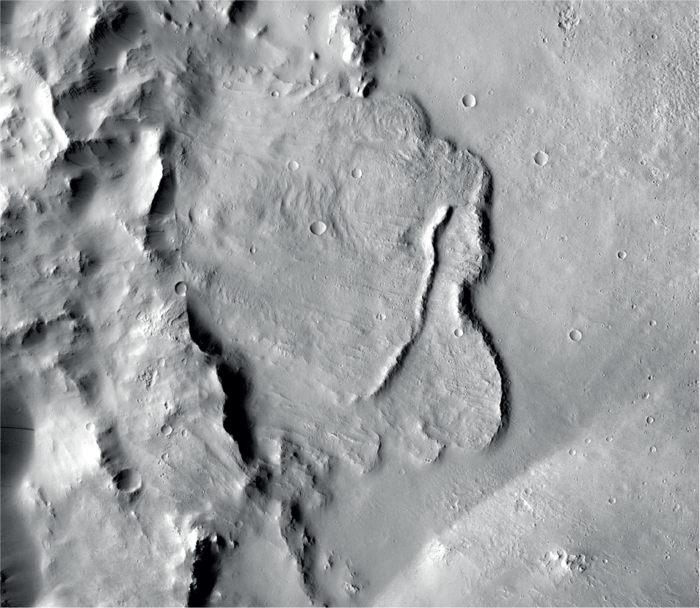 Many craters contain multiple features, all at depths of 2.5 to 3 miles – indicating that these craters once contained pools and flows of water that changed and receded over time. So an inevitable and most interesting question that arises is this: If there was robust and adaptable life on early Mars, might it have been transported underground in water too? The planet does have seismic activity — some are called Marsquakes — that can open fractures. It seems plausible that if life existed in water on the Martian surface, it would have flowed or trickled down fractures and other porous features to substantial depths. Given this hypothetical, many would have died but some may have lived and adapted. 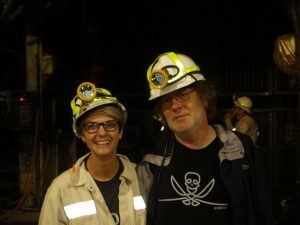 Rather like what can be seen on Earth in the South African mines. With this possibility in mind, the Borgonie paper recommends that the presence of surface fractures be kept in mind when landing sites are chosen on other planets or moons. Paleobiologist Susannah Porter finds evidence of predation in ancient microbial ecosystems dating back more than 740 million years. Vampires are real, and they’ve been around for millions of years. At least, the amoebae variety has. So suggests new research from UC Santa Barbara paleobiologist Susannah Porter. Using a scanning electron microscope to examine minute fossils, Porter found perfectly circular drill holes that may have been formed by an ancient relation of Vampyrellidae amoebae. These single-celled creatures perforate the walls of their prey and reach inside to consume its cell contents. Porter’s findings* appear in the Proceedings of the Royal Society B. “To my knowledge these holes are the earliest direct evidence of predation on eukaryotes,” said Porter, an associate professor in UCSB’s Department of Earth Science. Eukaryotes are organisms whose cells contain a nucleus and other organelles such as mitochondria. Porter examined fossils from the Chuar Group in the Grand Canyon — once an ancient seabed — that are between 782 and 742 million years old. The holes are about one micrometer (one thousandth of a millimeter) in diameter and occur in seven of the species she identified. The holes are not common in any single one species; in fact, they appear in not more than 10 percent of the specimens. According to Porter, this evidence may help to address the question of whether predation was one of the driving factors in the diversification of eukaryotes that took place about 800 million years ago. Porter also is interested in seeing whether oxygen played a role in predation levels through time. She noted that the microfossils those organisms attacked were probably phytoplankton living in oxygenated surface waters, but like vampyrellid amoebae today, the predators may have lived in the sediments. She suggests that those phytoplankton made tough-walled cysts — resting structures now preserved as fossils — that sank to the bottom where they were attacked by the amoebae. “We have evidence that the bottom waters in the Chuar Group in that Grand Canyon basin were relatively deep — 200 meters deep at most — and sometimes became anoxic, meaning they lacked oxygen,” Porter explained. “I’m interested to know whether the predators only were present and making these drill holes when the bottom waters contained oxygen,” Porter added. “That might tie the diversification of eukaryotes and the appearance of predators to evidence for increasing oxygen levels around 800 million years ago. A spark from a lightning bolt, interstellar dust, or a subsea volcano could have triggered the very first life on Earth. But what happened next? Life can exist without oxygen, but without plentiful nitrogen to build genes – essential to viruses, bacteria and all other organisms – life on the early Earth would have been scarce. The ability to use atmospheric nitrogen to support more widespread life was thought to have appeared roughly 2 billion years ago. Now research from the University of Washington looking at some of the planet’s oldest rocks finds evidence that 3.2 billion years ago, life was already pulling nitrogen out of the air and converting it into a form that could support larger communities. The results were published Feb. 16 in Nature. The authors analyzed 52 samples ranging in age from 2.75 to 3.2 billion years old, collected in South Africa and northwestern Australia. These are some of the oldest and best-preserved rocks on the planet. The rocks were formed from sediment deposited on continental margins, so are free of chemical irregularities that would occur near a subsea volcano. They also formed before the atmosphere gained oxygen, roughly 2.3 to 2.4 billion years ago, and so preserve chemical clues that have disappeared in modern rocks. Even the oldest samples, 3.2 billion years old – three-quarters of the way back to the birth of the planet – showed chemical evidence that life was pulling nitrogen out of the air. The ratio of heavier to lighter nitrogen atoms fits the pattern of nitrogen-fixing enzymes contained in single-celled organisms, and does not match any chemical reactions that occur in the absence of life. Genetic analysis of nitrogen-fixing enzymes have placed their origin at between 1.5 and 2.2 billion years ago. “This is hard evidence that pushes it back a further billion years,” Buick said. Fixing nitrogen means breaking a tenacious triple bond that holds nitrogen atoms in pairs in the atmosphere and joining a single nitrogen to a molecule that is easier for living things to use. The chemical signature of the rocks suggests that nitrogen was being broken by an enzyme based on molybdenum, the most common of the three types of nitrogen-fixing enzymes that exist now. Molybdenum is now abundant because oxygen reacts with rocks to wash it into the ocean, but its source on the ancient Earth – before the atmosphere contained oxygen to weather rocks – is more mysterious*. The authors hypothesize that this may be further evidence that some early life may have existed in single-celled layers on land, exhaling small amounts of oxygen that reacted with the rock to release molybdenum to the water. Future work will look at what else could have limited the growth of life on the early Earth. Stüeken has begun a UW postdoctoral position funded by NASA to look at trace metals such as zinc, copper and cobalt to see if one of them controlled the growth of ancient life. Other co-authors are Bradley Guy at the University of Johannesburg in South Africa, who provided some samples from gold mines, and UW graduate student Matthew Koehler. The research was funded by NASA, the UW’s Virtual Planetary Laboratory, the Geological Society of America and the Agouron Institute. A section of 1.8 billion-year-old fossil-bearing rock. The fossils (dark areas) are essentially identical to fossils 500 million years older and to modern microorganisms. An international team of scientists has discovered the greatest absence of evolution ever reported — a type of deep-sea microorganism that appears not to have evolved over more than 2 billion years. But the researchers say that the organisms’ lack of evolution actually supports Charles Darwin’s theory of evolution. The scientists examined sulfur bacteria, microorganisms that are too small to see with the unaided eye, that are 1.8 billion years old and were preserved in rocks from Western Australia’s coastal waters. Using cutting-edge technology, they found that the bacteria look the same as bacteria of the same region from 2.3 billion years ago — and that both sets of ancient bacteria are indistinguishable from modern sulfur bacteria found in mud off of the coast of Chile. Schopf said the findings therefore provide further scientific proof for Darwin’s work. “It fits perfectly with his ideas,” he said. 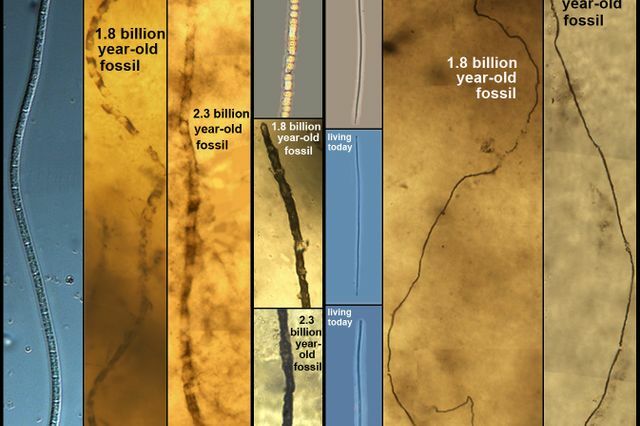 The fossils Schopf analyzed date back to a substantial rise in Earth’s oxygen levels known as the Great Oxidation Event, which scientists believe occurred between 2.2 billion and 2.4 billion years ago. 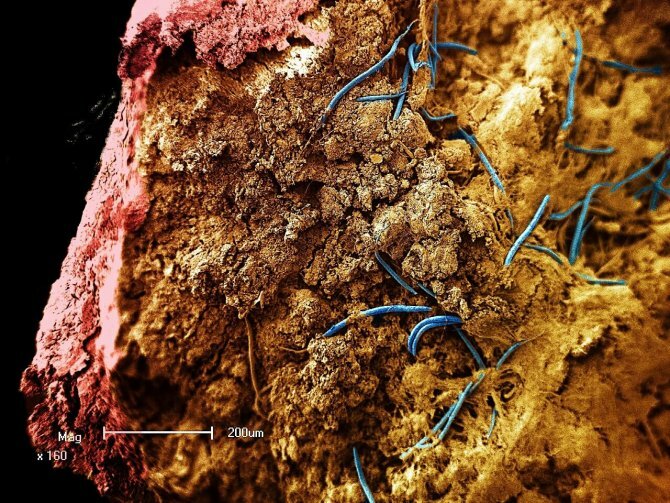 The event also produced a dramatic increase in sulfate and nitrate — the only nutrients the microorganisms would have needed to survive in their seawater mud environment — which the scientists say enabled the bacteria to thrive and multiply. Schopf used several techniques to analyze the fossils, including Raman spectroscopy — which enables scientists to look inside rocks to determine their composition and chemistry — and confocal laser scanning microscopy — which renders fossils in 3-D. 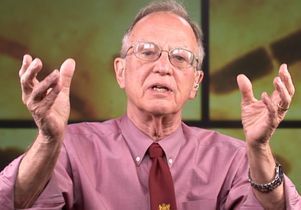 He pioneered the use of both techniques for analyzing microscopic fossils preserved inside ancient rocks. 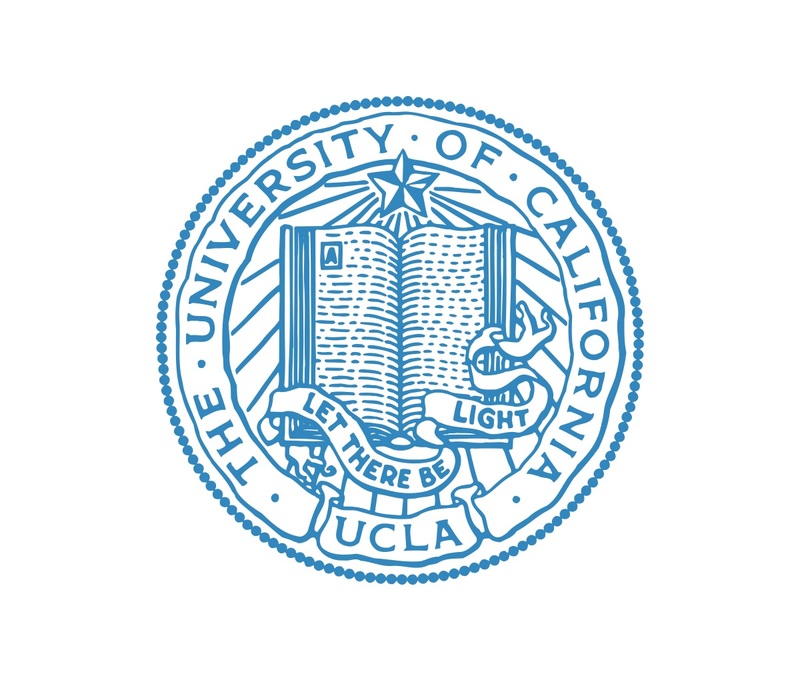 Co-authors of the PNAS research were Anatoliy Kudryavtsev, a senior scientist at UCLA’s Center for the Study of Evolution and the Origin of Life, and scientists from the University of Wisconsin, NASA’s Jet Propulsion Laboratory, Australia’s University of New South Wales and Chile’s Universidad de Concepción. Schopf’s research is funded by the NASA Astrobiology Institute. 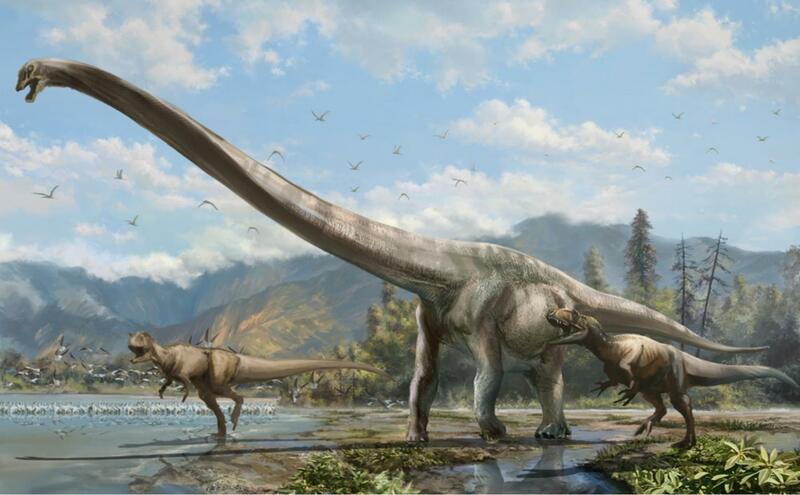 University of Alberta paleontologists including PhD student Tetsuto Miyashita, former master’s student Lida Xing and professor Philip Currie have discovered a new species of a long-necked dinosaur from a skeleton found in China. The findings have been published in a new paper in the Journal of Vertebrate Paleontology. Qijianglong (pronounced “CHI-jyang-lon”) is about 15 metres long and lived about 160 million years ago in the Late Jurassic. The name means “dragon of Qijiang,” for its discovery near Qijiang City, close to Chongqing. The fossil site was found by construction workers in 2006, and the digging eventually hit a series of large neck vertebrae stretched out in the ground. Incredibly, the head of the dinosaur was still attached. “It is rare to find a head and neck of a long-necked dinosaur together because the head is so small and easily detached after the animal dies,” explains Miyashita. The new species belongs to a group of dinosaurs called mamenchisaurids, known for their extremely long necks sometimes measuring up to half the length of their bodies. Most sauropods, or long-necked dinosaurs, have necks only about one-third the length of their bodies. Unique among mamenchisaurids, Qijianglong had neck vertebrae that were filled with air, making their necks relatively lightweight despite their enormous size. Interlocking joints between the vertebrae also indicate a surprisingly stiff neck that was much more mobile bending vertically than sideways, similar to a construction crane. “Qijianglong is a cool animal. If you imagine a big animal that is half neck, you can see that evolution can do quite extraordinary things,” says Miyashita. Mamenchisaurids are only found in Asia, but the discovery of Qijianglong reveals that there could be as many differences among mamenchisaurids as there are between long-necked dinosaurs from different continents. Miyashita believes that mamenchisaurids evolved into many different forms when other long-necked dinosaurs went extinct in Asia. “It is still a mystery why mamenchisaurids did not migrate to other continents,” he says. It is possible that the dinosaurs were once isolated as a result of a large barrier such as a sea, and lost in competition with invading species when the land connection was later restored. UAlberta’s daring and innovative spirit inspires faculty and students to advance knowledge through research, seek innovation in teaching and learning, and find new ways to serve the people of Alberta, the nation, and the world. Cantona was one of the largest cities in pre-Columbian Mesoamerica, with a population of 90,000 inhabitants at its peak. Scientists believe climate change was part of the reason the city was eventually abandoned. 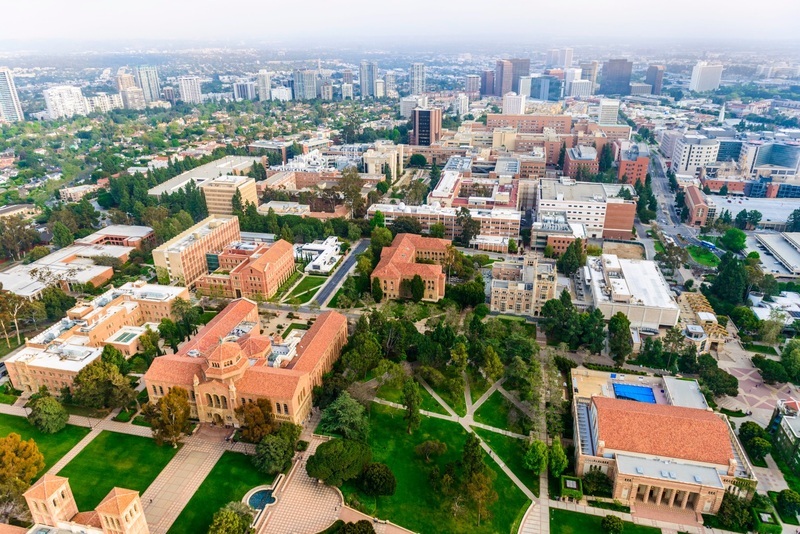 The research appears in the online edition of the Proceedings of the National Academy of Sciences for the week of Jan. 26. 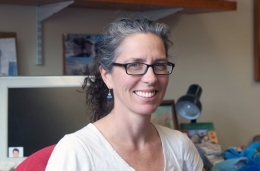 Lawrence Livermore researcher Susan Zimmerman and colleagues analyzed pollen, stable isotopes and elemental concentrations, which serve as proxies of past climatic and environmental conditions, from lake sediments in the region and found evidence of a regional drought between 500 and 1150 AD*, about the time Cantona was abandoned. 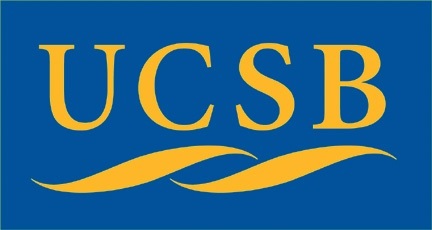 Using Lawrence Livermore’s Center for Accelerator Mass Spectrometry, the team — consisting of the University of California, Berkeley; Universidad Nacional Autonóma de Mexico; and the GFZ German Research Center for Geosciences — dated terrestrial organic material from 12-meter-long sediment cores from the lake to establish the age control for this study. 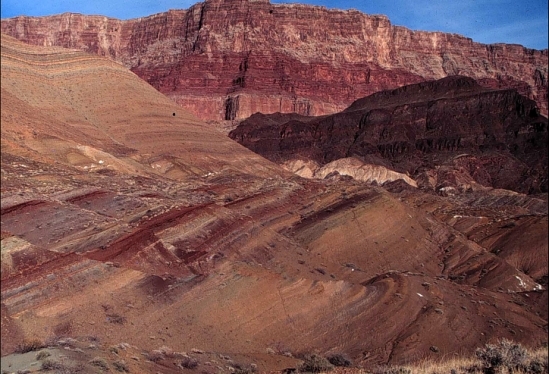 Radiocarbon dating and an age model showed that the centennial-scale arid interval between 500 and 1150 was overlaid on a long-term drying trend. The cores cover the last 6,200 years; however, the team focused on the last 3,800 years. Cantona is now an archaeological site in Mexico, on the border with Veracruz, about an hour’s drive from the city of Puebla. Limited archaeological work has been done at the site, and only about 10 percent of the site can be seen. It was a prominent, if isolated, Mesoamerican city between 600 and 1000 AD. It was abandoned after 1050 AD. The team conducted a subcentennial reconstruction of regional climate by taking sediment samples from a nearby crater lake, Aljojuca. The modern climate of the region suggests that proxy data from the sediments record changes in summer monsoonal (May through October) precipitation. “Our results suggest that climate change played a contributing role in the site’s history,” Zimmerman said. The paper’s co-authors are Jonathan Bloch of the Florida Museum of Natural History at the University of Florida, who also contributed to the research as an Edward P. Bass Distinguished Visiting Environmental Scholar in the Yale Institute for Biospheric Studies; Doug Boyer of Duke University; and William Clemens of the University of California Museum of Paleontology, who collected fossils of Purgatorius and geological data over the past four decades with members of his field crews in Montana. 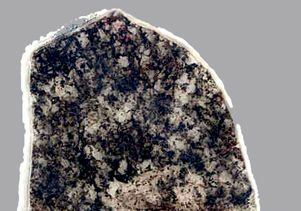 Minuscule, fossilized pieces of plants could tell a detailed story of what the Earth looked like 50 million years ago. A 49 million-year-old phytolith. Its curvy, large shape indicate the plant it came from grew in shady conditions. 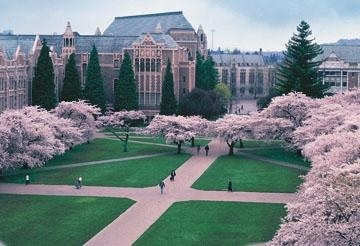 Scale bar is 10 micrometers.Regan Dunn, U of Wash.
An international team led by the University of Washington has discovered a way to determine the tree cover and density of trees, shrubs and bushes in locations over time based on clues in the cells of plant fossils preserved in rocks and soil. Tree density directly affects precipitation, erosion, animal behavior and a host of other factors in the natural world. Quantifying vegetation structure throughout time could shed light on how the Earth’s ecosystems changed over millions of years. “Knowing an area’s vegetation structure and the arrangement of leaves on the Earth’s surface is key for understanding the terrestrial ecosystem. It’s the context in which all land-based organisms live, but we didn’t have a way to measure it until now,” said lead author Regan Dunn, a paleontologist at the UW’s Burke Museum of Natural History and Culture. Dunn completed this work as a UW doctoral student in the lab of Caroline Strömberg, the Estella B. Leopold associate professor in biology and curator of paleobotany at the Burke Museum. The findings are published Jan. 16 in the journal Science. The team focused its fieldwork on several sites in Patagonia, Argentina, which have some of the best-preserved fossils in the world and together represent 38 million years of ecosystem history (49-11 million years ago). Paleontologists have for years painstakingly collected fossils from these sites, and worked to precisely determine their ages using radiometric dating. The new study builds on this growing body of knowledge. The researchers work in Miocene-aged deposits near Rio Chico in Chubut Province, Argentina.Regan Dunn, U of Wash. In Patagonia and other places, scientists have some idea based on ancient plant remains such as fossilized pollen and leaves what species of plants were alive at given periods in Earth’s history. For example, the team’s previous work documented vegetation composition for this area of Patagonia. But there hasn’t been a way to precisely quantify vegetation openness, aside from general speculations of open or bare habitats, as opposed to closed or tree-covered habitats. “Now we have a tool to go and look at a lot of different important intervals in our history where we don’t know what happened to the structure of vegetation,” said Dunn, citing the period just after the mass extinction that killed off the dinosaurs. Fossil phytoliths from a 40 million-year-old soil from the Sarmiento Formation, Gran Barranca, Chubut, Argentina. At the center is an epidermal phytolith indicative of open habitats by its smaller, less curvy shape. Scale bar is 10 micrometers.Regan Dunn, U of Wash.
Work by other scientists has shown that the cells found in a plant’s outermost layer, called the epidermis, change in size and shape depending on how much sun the plant is exposed to while its leaves develop. For example, the cells of a leaf that grow in deeper shade will be larger and curvier than the cells of leaves that develop in less covered areas. Dunn and collaborators found that these cell patterns, indicating growth in shade or sun, similarly show up in some plant fossils. When a plant’s leaves fall to the ground and decompose, tiny silica particles inside the plants called phytoliths remain as part of the soil layer. The phytoliths were found to perfectly mimic the cell shapes and sizes that indicate whether or not the plant grew in a shady or open area. The researchers decided to check their hypothesis that fossilized cells could tell a more complete story of vegetation structure by testing it in a modern setting: Costa Rica. Dunn took soil samples from sites in Costa Rica that varied from covered rainforests to grassy savannahs to woody shrub lands. She also took photos looking directly up at the tree canopy (or lack thereof) at each site, noting the total vegetation coverage. This hemispherical photograph shows the tree canopy cover at a site in Santa Rosa National Park, Costa Rica. The corresponding forest profile (modified from Holdridge et al., 1971) gives a side profile of the forest’s density.Regan Dunn, U of Wash.
Back in the lab, she extracted the phytoliths from each soil sample and measured them under the microscope. When compared with tree coverage estimated from the corresponding photos, Dunn and co-authors found that the curves and sizes of the cells directly related to the amount of shade in their environments. The researchers characterized the amount of shade as “leaf area index,” which is a standard way of measuring vegetation over a specific area. Testing this relationship between leaf area index and plant cell structures in modern environments allowed the team to develop an equation that can be used to predict vegetation openness at any time in the past, provided there are preserved plant fossils. When Dunn and co-authors applied their method to 40-million-year-old phytoliths from Patagonia, they found something surprising — habitats lost dense tree cover and opened up much earlier than previously thought based on other paleobotanic studies. This is significant because the decline in vegetation cover occurred during the same period as cooling ocean temperatures and the evolution of animals with the type of teeth that feed in open, dusty habitats. The research team plans to test the relationship between vegetation coverage and plant cell structure in other regions around the world. They also hope to find other types of plant fossils that hold the same information at the cellular level as do phytoliths. Other co-authors are Matthew Kohn of Boise State University and Alfredo Carlini of Universidad Nacional de La Plata in Argentina. The research was funded by the National Science Foundation, the Geological Society of America, UW Biology and the Burke Museum. For more information, contact Dunn at dunnr@uw.edu or 206-685-0374.